The internet is overloaded with content. Just staying up-to-date and informed is a challenge. But instead of opening each site a half-dozen times a day, you can use an RSS app to curate your content automatically. You can just open an RSS reader app and see what's new on all of those sites together. We did our research and we found for you one amazing RSS reader app that will help you keep up with the latest world news. Let's see what the app is all about. What is Quick World News? On this news and magazine app developed on android platform, users can search and read the latest world news in one place, fast and easy. This news reader is quite easy for using, offering users to find breaking world news in one place without spending much time searching. On the app, users can find each important news on their phone, add their own favorite sources and even read local, world or USA news, keeping up with the latest world news always. With the Quick World News users are getting one simple and friendly user interface with RSS feed reader which helps the user follow many different sources, to add his own podcasts and listening them, use the app's widgets, add his own sources from every category. Using the app, users can do everything, from following world news to following just headlines of the local news. 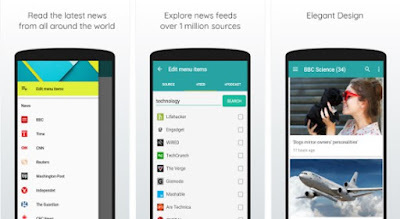 The app offers wide range of default sources available that allow users to add every RSS feed they like. Using the clean and neat design of the app users can customize their sources, feeds and podcasts and make them show on the main menu or choose the themes. With the app users are getting 2 gadgets as the news widget for people that are in rush and want to find and check easily the world news with headlines showing or just to browse through the latest news and feet from the whole world. Download the app now on Google Play for free.